To further prepare players for the release of Fallout 4 in November, Bethesda Softworks announced the Fallout Anthology during Quakecon’s welcome speech. 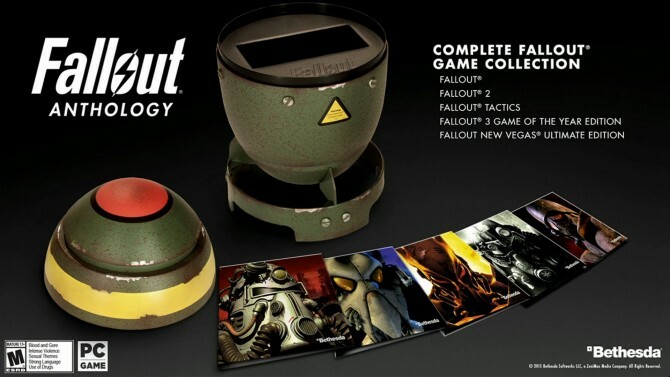 Fallout Anthology will include all games in the series for $49.99 in a limited edition, mini-nuke casing. And by all games, we mean their adjoining DLC as well – you can look forward to Fallout, Fallout 2, Fallout 3: Game of the Year Edition, Fallout New Vegas Ultimate Edition and even Fallout Tactics. That’s a whole lot of Fallout, especially when you consider that Bethesda also launched Fallout Shelter for mobile devices recently. The anthology will release on September 29th in North America and October 2nd in Europe for PC, allowing for more than a month to get through all the games before Fallout 4’s release. Because surely that will be enough. Fallout 4 is out on November 10th for Xbox One, PC and PS4. What are your thoughts on this massive anthology though? Let us know in the comments below.